Discussion in 'Computer Hardware' started by Shotgun Chuck, Apr 4, 2019. You might remember a while ago that I posted a thread asking for help building a computer. This is being posted from that computer, and I love it. However, I am having some on-and-off stability issues. At one point it would lock randomly and frequently, and also once gave a "page fault in nonpage area" bluescreen; the latter only happened once and the lockups stopped after I reversed a vcore tweak I'd made in an attempt to keep heat down. 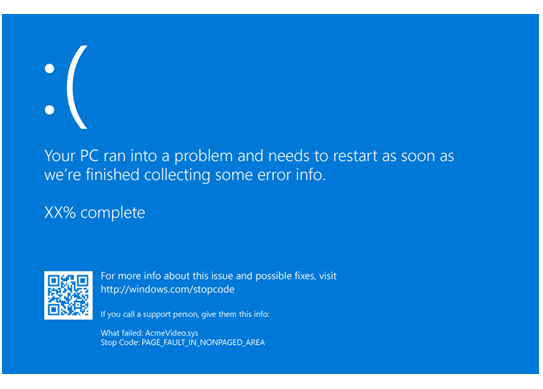 However just now I got a "kernel mode heap corruption" bluescreen which required a restart; from what I've seen on a search that may be related to geForce graphics drivers? However the guy who reported that had it happen way more often than I did. If it's shown, check the program that causes the bluescreen directly from the bluescreen page, just above "Stop Code". When in Windows press the Win Key > write Event Viewer > open the app > wait till it loads a graph > click on the small Plus of first line (Critical) > double click the first error (generally all the errors here are from bluescreens) and read what's wrong. If there's a NV error, it means that something is failing in the GPU drivers. Btw these errors can mean everything from a bad slot on the motherboard to failing ram, to software corruptions. "Kernel mode heap corruption" is probably a gpu error (driver corruption or faulty gpu, more probably the first one), while "Page fault in nonpaged area" can be from a faulty drive, to bad ram/ram frequencies that are set incorrectly to faulty motherboard slots. I recommend you to reinstall GPU drivers, if this is not enough clear the BIOS (check mobo manual) and if it doesn't solve the problem you should run Memtest 86+ (there are many tutorials to set Memtest up). Memtest86 came up clean after four passes, I've heard of some people getting heap corruption errors with nVidia driver updates but usually worse than this. Anyways have you checked the errors in Event Viewer? If you think it's nvidia drivers try to do a completely clean reinstallation with DDU (Display Driver Uninstaller), a freeware that helps you to do a true clean reinstall of the graphics drivers. First download (but don't install) the latest drivers from Nvidia site, disconnect the pc from the internet (turn off Wifi or disconnect ethernet cable), run the program and follow the instructions (there are how to tutorials on the web). After the cleaning, reinstall the latest drivers you downloaded before. I suggest you to check if you have the latest BIOS version and all the latest drivers too; if not update them as they solve the problems sometimes (it's better to have latest drivers in any case). If all of this doesn't help, then you should start a hardware troubleshooting (remove on estick of ram, test, if there are no problems, test the other; change the gpu with something else to check if it's drivers or the gpu itself that cause the problem) and that can be very time consuming (I've spent over two days troubleshooting my faulty ram) as you have to test the same thing with different combinations. Alright so. I went to Event Viewer and started poking around. Kernel Mode Heap Corruption is frequently caused by buggy drivers, I looked up Page Fault in Nonpage Area again and it turns out that can be caused by buggy drivers as well (memtest86 came back clean as a whistle so that's a distinct possibility). I also discovered many "minor" problem-with-hardware errors that seem to happen almost every day but aren't severe enough to cause a crash; I looked up the codes and found that it almost always comes back to the video subsystem. Yeah, maybe a liquid-cooled 1060-6 for only $200 made by a company from Macau was too good to be true, but considering the (much worse) driver problems other people have had I'm still going to have to assume for now that a lot of this is nVidia needing to stop derping around and get their stuff together. I may also investigate my Logitech G27 drivers even though that's not really in the video subsystem. I did just download updated graphics card drivers so maybe that will do something...? I hope for you it does… Follow a DDU tutorial to remove correctly the old drivers to avoid conflicting/corrupted drivers that can cause even worse problems/crashes. 0x3D55: Package family Microsoft.People_8wekyb3d8bbwe runtime information is corrupted. Attempting to correct the issue. 0x80070057: Package family MICROSOFT.PEOPLE_8WEKYB3D8BBWE runtime information is corrupted but we cannot repair it at this time. Over and over and over and over again, along with an event ID 69 involving some XBox Games Overlay at bootup. One possibly related item is that when the Kernel Mode Heap Corruption bluescreen happened, the computer did its "we're going to restart for you" thing and then never did. It just sat there forever and had to be forced off. Of course this leads to it wanting to check the disk when we turn it back on, but once allowed to do that... nothing changes and the next time it boots up, it still wants to check the disk. There's something broken in Windows People app, probably caused by a corrupted update. The computer didn't restart because you probably have a "Don't restart after crash" or something along that turned on in the options, which is good because you can see the stop code and write it down for investigation. To check it, follow this procedure: Control Panel > System and security > System > Advanced System Options (to the right) > Startup and Recovery > check if there's a tick on "Automatically Restart". If there is and the computer didn't restart, it may have crashed again in the bluescreen (it has happened to me). If you want to check the disk you can via the command prompt, with the check disk (chkdsk) command: search the internet for further explaination, but it's actually very simple. If the situationgets worse, I'd suggest you to either run a windows recovery stuff and try to save what you can or reinstall Windows 10, which is better imo, because you can install all the latest drivers without the risk of corruption. Oh look, BSOD on startup, system service exception, ntfs.sys. Sounds scary, better look that up... oh look, that can be caused by bad drivers too. GET IT TOGETHER, NVIDIA! LIKE ARE YOU KIDDING ME RIGHT NOW! I doubt it being Nvidia, after all I have not experienced any of such with Nvidia card. Your system appears to be quite unstable, I wonder if it is potentially bad GPU or maybe motherboard power side of things, that can make quite lot of trouble. Only time I have got blue screen has been when I did go too low vcore when finding out what is smallest I can run reliably. After finding optimal vcore I have not had any instabilities or problems of such magnitude, certainly can't agree it being Nvidia issue. I would try running blender benchmark CPU compute test and see if system really is stable or not, maybe some prime95 too, desktop and gaming stable might not be fully stable and can do some odd glitches at times. However be very careful as you have had high CPU temp issues too, generally computer should be able to handle those tests just fine, but with temps you have got running just single car in BeamNG, I'm not all too sure things are 100% up to those test, maybe MB has some issue with VRM and gives something else to CPU than it shows, idk. Also are you sure you have not hit temps higher than Tcase and that there is no some damage from high temps? Lowest cost manufacturer's GPUs also can be bit more problematic than mid priced brands, it can show up as reliability among many other things. My Nvidia driver is version 416.34 and I can tell that there is zero issues with it that I would have observed. I also haven't had single crash after I did found optimal vcore for the system, well except bugs in BeamNG causing crash, but that is different. For my CPU temps right now, I get Idle at 24C Maximum when running banana bench 48C, fans at 560rpm all the time, it is very rare that fans speed up, VRM fan is only one that speeds up, but AIO pump I keep at lowest 1000rpm setting, really I can recommend Corsair H100i Pro AIO setup, it is very quiet and for such low sound level (as quiet as best air coolers) performance is impressive. Also with 6 year warranty it is impressive cooler for the price, but surely lot more expensive than air cooler of similar performance. If it would be drivers, then it should affect all? Sure it could be only with certain hardware, but still that would be easy to test out, just install different version drivers and see what happens. For me, not a single of such errors has happened. Did you clear CMOS @Shotgun Chuck? It helped with my problem (something wrong in voltages) after I changed the RAM that was spitting errors and bluescreening the pc. And as I stated before, there's something broken in your Windows OS. You should backup all the important files and reinstall it completely. Before reinstalling, update the Motherboard BIOS just to have the latest version available. After the fresh install go ahead and download and install ALL the latest drivers and check if the problem is still there.